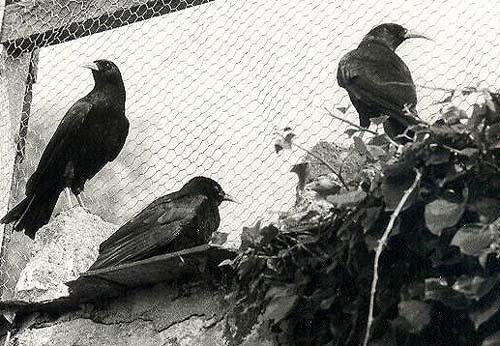 Operation Chough was officially launched in 1987, but much work with Red-billed Choughs had been done at Paradise Park in Hayle, Cornwall and the Tropical Bird Gardens, Padstow (now closed), before this time. Paradise Park’s founder, Mike Reynolds, became very interested in choughs and the first birds came to the Park in 1973. They were captive bred and originally from Welsh stock. This date was very sadly also the time when the last wild birds from the original Cornish population disappeared after decades of decline. Our work to understand the biology of the chough, the reasons for its decline and to formulate a plan for its recovery in Cornwall and elsewhere, took several courses. Much of the early work at Paradise Park involved developing breeding methods and improving aviary and nest box designs. Although we preferred to have parent-reared chicks, this also involved hand-rearing some, which proved to be extremely difficult but some successes were achieved. Large flights were built for maximum fitness levels and winter season socialisation, and to allow a lot of access to the ground. To avoid disturbance smaller seclusion aviaries are used during the breeding season. Nest boxes were fitted with cameras to monitor eggs and chicks, and this proved to be invaluable. Long hours to provide an abundance of favoured foods from dawn to dusk, veterinary interventions if needed, and perseverance, means that parent-reared chicks are now regularly produced by the pairs at the Park. We produced a ‘Red-billed chough captive management and husbandry manual’ and a version of this was published in Zoo Biology (Nov/Dec 2012) as ‘Captive Breeding and Socialization of the Red-billed Chough (Pyrrhocorax pyrrhocorax)’ with lead author Dr Malcolm Burgess and thanks to support from Conservation Works (www.conservationworks.org). In 1987 we sponsored a five year long study by Richard Meyer on the feasibility of the re-establishment of the chough in Cornwall. As well as researching historic sites in Cornwall, he used chough populations in Wales for much of his research. 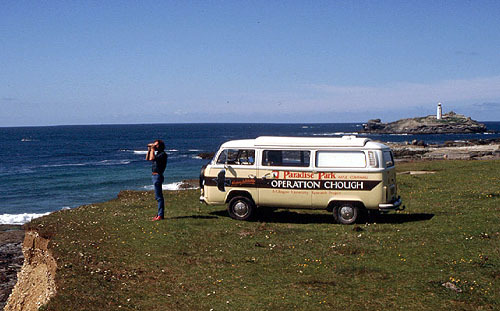 Richard Meyer and the Chough bus at Godrevy circa 1987. Another part of the work has been genetic research. This included taking samples from Victorian museum specimens in Truro Museum in 2000, and providing blood samples from our birds for studies comparing chough genetics in all of the UK populations and those further into Europe. A trial release of captive-bred birds took place in 2003 on the north coast of Cornwall. Six birds were released, with two surviving until late November, at Trevean, near Zennor until one of the pair was shot dead by a man living locally. As well as breeding choughs at Paradise Park we are able to highlight the plight of the species though our two friendly choughs which often star in our free flying show. They give the presenters an opportunity to raise awareness about the birds in the wild and the Park’s involvement in Operation Chough. Nest cameras give a unique insight into the lives of the chough, and we broadcast live via our nestcams through the breeding season here. Operation Chough timeline click here.